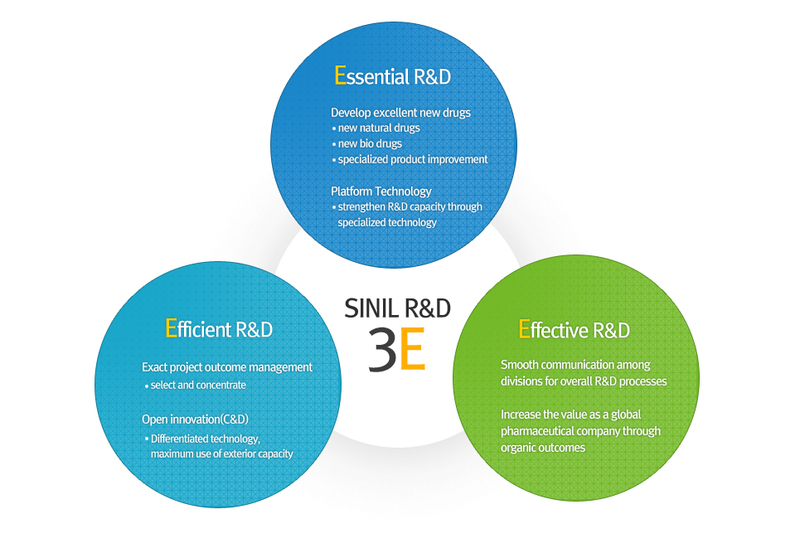 With the “3E” philosophy of Effective, Efficient, and Essential R&D, SINIL’s Life Science R&D Center is dedicated to developing high-value added products such as new modified products, new natural drugs, and super generics. This is due to technology based on global competitiveness and to survive in a rapidly changing pharmaceutical industry, and carrying out active and passionate research activities for developing a new growth engine for the future through a green bio-business. SINIL’s Life Science R&D Center is dedicated to maintaining high competitiveness by building close networks with universities and public research institutions, securing unique technology and global core technology, and by laying the foundation for creative R&D from excellent talents. Based on this, we are trying our best to provide a strong engine to realize ‘the Respect of Life and Health’ Society’ by developing various products including First & Best new drugs.